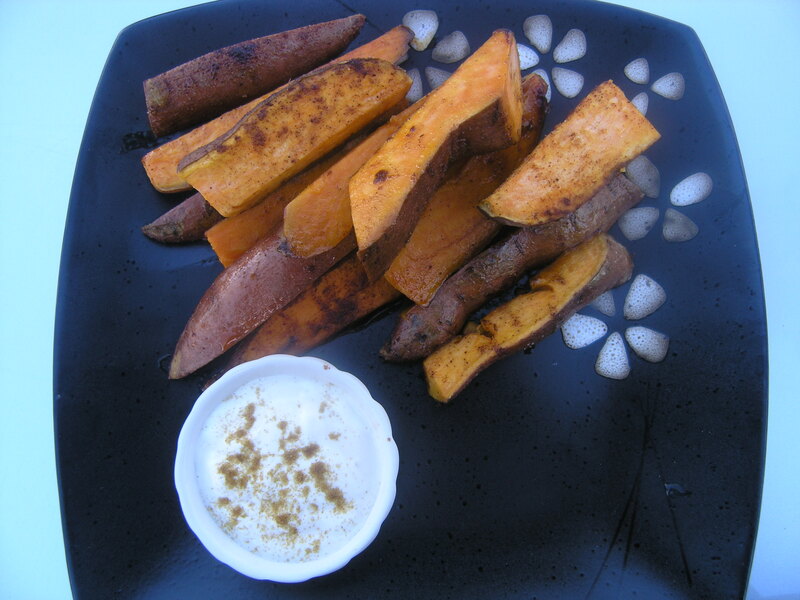 Sweet potatoes are the perfect side dish to many meals. Even though they are naturally sweet, they take on a number of great flavors. I prefer to add a little kick when making them, which I think enhances the sweetness and gives the palate a welcome, unexpected flavor. This is my version of the winter holiday sweet potato concoction that normally contains marshmallows, butter, butter, and butter. I leave most of the calories behind, and have a new variation with a little more heat, a little more crunch, and a lot of great flavor. Rinse the potatoes and pat them dry with paper towel. Cut them in half vertically and cut each half into 3 slices. Set the potatoes aside on a cookie sheet. Combine the vegetable oil and following 7 spices in a mixing bowl. Drizzle the mixture over the sweet potatoes and toss it all together with your hands, making sure that everything is well coated. While the potatoes are baking, whisk the sour cream with the remaining dipping sauce ingredients in a small bowl. Place in a serving container (or individual small ramekins) and refrigerate until serving. Remove the potatoes from the oven serve hot.